Southridge First School pupils outside the Spanish City site in Whitley Bay. Schoolchildren have been given a special behind-the-scenes tour of work to regenerate Whitley Bay’s Spanish City. School council pupils from Marine Park First School and Year 4 students at Southridge First School paid a special visit to the site. Southridge First School pupils on a tour of the Spanish City site. They were taken on a tour of the Grade II-listed building and learnt about the work to restore it. 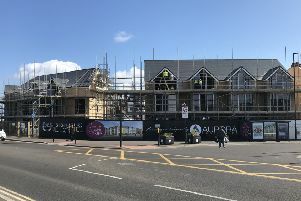 North Tyneside Council, in partnership with Robertson Construction and architecture firm ADP, is carrying out a £10million restoration of the building. Project Manager Andrew Coleman from Robertson Construction led the tours. Beforehand, the children were split into groups and challenged to build the tallest tower out of Lego – the winners were Molly, Zafar, Mitchell and Leo from Marine Park whose tower reached 1.46m. Tower challenge winners Molly, Zafar, Mitchell and Leo from Marine Park First School. Carol Lynch, teaching assistant at Marine Park First School, said: “All the children really enjoyed the visit and had been looking forward to it for weeks beforehand. Sue Hall, head teacher at Southridge First School, added: “The pupils found it extremely interesting to visit a live construction site. “The staff made it very accessible for our pupils and it’s very important that they understand changes to their local community. Mayor Norma Redfearn said: “I am delighted that these groups of schoolchildren have had the opportunity to see the progress being made.